“I’m sorry, your old marketing strategy can’t come to the phone right now. Okay, perhaps that wasn’t quite as catchy as the original. The fact that you recognized the reference is a testament to Taylor’s influence. When she released her comeback single, “Look What You Made Me Do,” the internet exploded with parodies of the spoken-word bridge. Everyone from fans to brands participated in the trend. Whether you love or hate her, there is no denying that Taylor Swift has an impressive promotional team. Swift is a fascinating case study in marketing strategy. As creators, we can only hope that our content is powerful enough to catapult our brands to the coveted status of household name. This week we turned to one of the world’s biggest pop stars for marketing tips and advice. We gathered marketing lessons from some of Taylor’s biggest hits. Are you … ready for it? Creating content for public consumption will inevitably lead to a few hate comments. No matter how much thought and effort you put into a blog post or social media update, there’s always the possibility that a keyboard warrior will voice their distaste in your content. Whether that’s in the form of constructive criticism or an outwardly offensive comment, it can be disheartening to read harsh words after you’ve poured your heart into your content. While you shouldn’t ignore your critics completely, you also don’t have to take their unkind words to heart. If someone gives you constructive criticism, incorporate the feedback into your future work. It will help you become a better content creator. If someone leaves a mildly distasteful comment, you could try to respectfully and politely reason with them. Of course, make sure you don’t get defensive – that could make things worse! Social media is the perfect avenue for quick customer service. Responding to distasteful comments in a calm manner demonstrates your professionalism. You might even be able to resolve the issue completely. If a particularly nasty comment feels like a “troll”- a person who makes deliberately offensive posts on the internet in hopes of garnering an emotional response – feel free to ignore or delete it (especially if it’s vulgar). They’re only looking for bad blood. Shake it off, shake it off! Your social media followers chose to follow your profile because they like your content. Don’t leave them with a blank space where your content should be! To keep your audience engaged, you should post on your various social media channels at least 5 times per week. According to one poll, nearly 18% of users who recently unfollowed a brand on social media cited infrequent posting as the cause for unfollowing. You don’t want a long list of ex-followers! 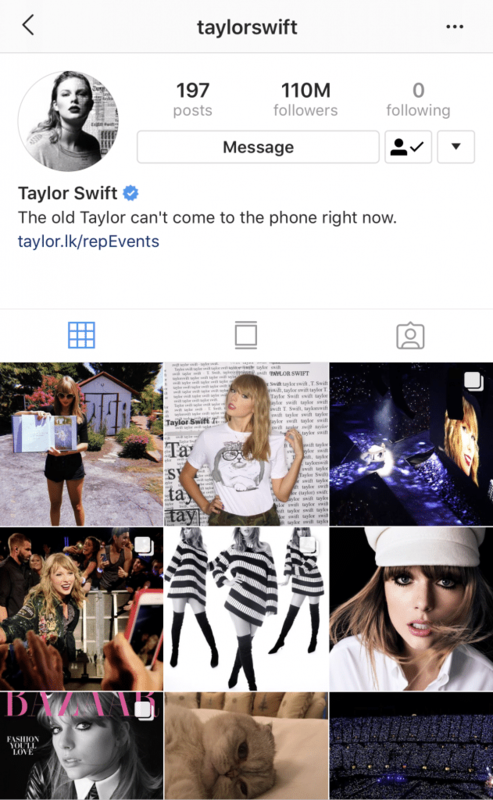 How does Taylor use her social media? With the release of her most recent album, reputation, Taylor pulled back from posting personal photos or tweets. Instead, she shared promotional posts and snaps from her performances. Now fans can expect new content every day Taylor has a show. The few times she hasn’t posted after a concert, some fans took to social media to air their discontent. This is a perfect example of the importance of sticking to a consistent posting schedule. 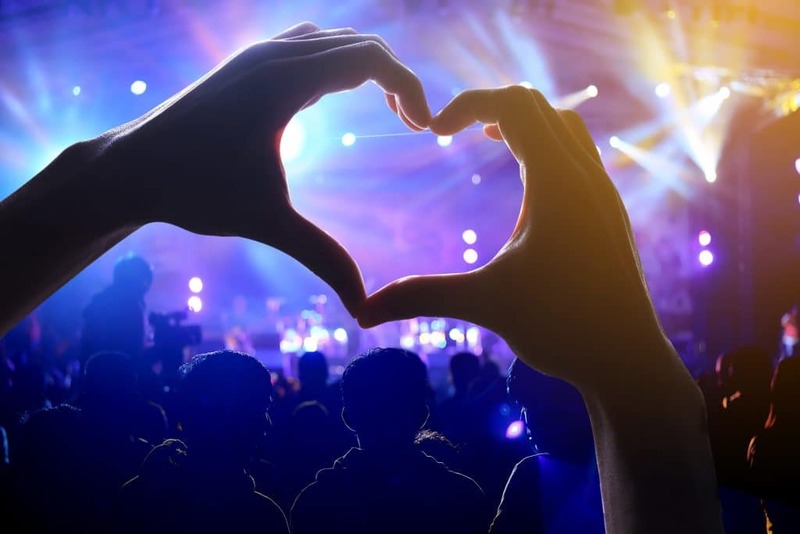 Though you may not be currently touring sold-out stadiums, setting a posting schedule is vital to your social media success. Check out this blog post for a few hints on how to create the most productive social media schedule for your business. Once you’ve decided on the perfect posting schedule, stick to it, or your social media presence runs the risk of going down in flames. In addition to a consistent posting schedule, Taylor has a track record of interacting with fans via social media. She has her own Tumblr blog where she jokes with fans. She joins fans’ live streams on Instagram. She lurks on social media and chooses fans to invite backstage. If one of the most in-demand pop stars in the world has time to interact with her followers, so do you! Respond to comments and messages as often as possible. Even an action as simple as liking a comment can make your audience feel appreciated. Social media relationships are a two-way street. Take several minutes each day to monitor your social media platforms. Reinventing your brand can be intimidating. Once you have a consistent posting schedule and a well-rounded portfolio of content, it can be tempting to settle into a safe routine. However, if you refuse to innovate with your content, your audience will eventually grow bored. Maintaining the attention of your social media followers requires an ever-evolving image. When Taylor Swift wanted to reinvent herself, she did it with bombast. She wiped all of her social media platforms and began posting cryptic hints about her upcoming release. The internet was abuzz with theories about what the sudden media wipe could mean. When she finally announced her upcoming album, she had a captive audience eager to receive the news. Your image change doesn’t have to be quite that dramatic. In fact, it probably shouldn’t be – few brands could pull off the same stunt and achieve similar results. But Taylor’s successful transformation from tween country starlet to pop maven is proof that reinventing your brand can have tremendous results. Challenge yourself to create content outside your comfort zone; you may be pleasantly surprised with the outcome. Taylor’s first smash single “Tim McGraw” may have been released in 2006, but it still receives radio play to this day. The song has an evergreen quality that allows it to be played on country stations more than a decade after its initial release. The term “evergreen” refers to content that is always relevant to reader interests and, therefore, less likely to become dated. The idea is to write compelling content that can be easily found by search engines for years to come. Search engines crawl millions of web pages to find the best fit for a user’s query. If the engine determines that your content is valuable and optimized for certain search terms, it will be rewarded with a higher ranking in search results. Try to have a mixture of both evergreen and time-sensitive content in your repertoire. Having a delicate balance of content ensures that your blog will never go out of style. Constantly creating new content can be exhausting. If you’re feeling like you’re trapped in a creative slump, breathe new life into your existing content by repurposing it! It would be a shame to spend hours creating a piece of content for one-time use. By repurposing your content, you can get more mileage out of your most successful posts. Taylor happens to be a master of repurposing. She finds new ways to incorporate her old country songs into new pop performances. She’s performed fan-favorite “Love Story” on all 5 of her tours, giving the song a different spin each time. For the Reputation Stadium Tour, she revamped the banjo-laden “Should’ve Said No” in a mashup with the pop-trap track “Bad Blood.” Swift understands how to keep fans entertained by giving her old songs a fresh production. And that’s just the beginning! There are dozens of creative ways to reuse your content. When it comes to creating content, the key to success is to work smarter, not harder. In a creative rut? Repurpose your old content to get you out of the woods! 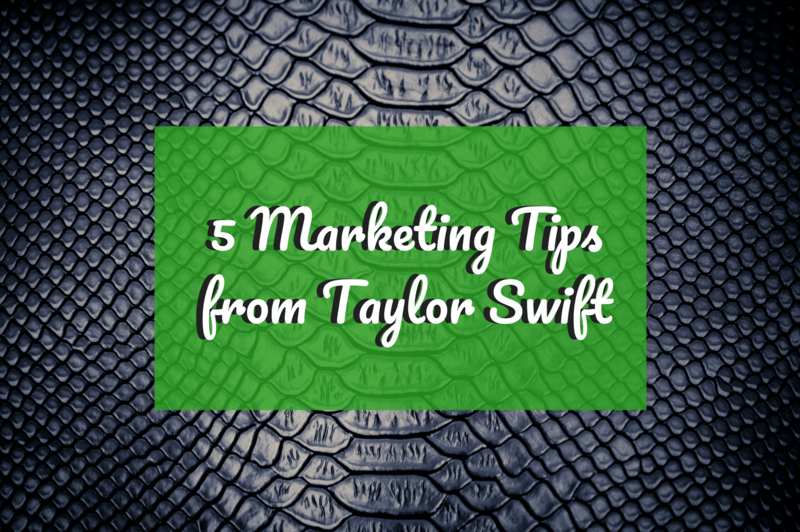 Your brand may not be an international pop sensation, but you can take these hints from Taylor Swift’s marketing strategy. Follow these marketing tips and you’ll be on your way to having the big reputation of your wildest dreams. Do you have any Taylor tips that we missed? Share them with us in the comments! Check our other blog posts for more advice on brand development, social media management, and more.